Preliminary information from the ATSB shows that a Virgin Australia ATR-72 flew several days with undetected structural damage. On 20 February 2014, Virgin Australia Regional Airlines was operating an ATR 72 aircraft, registered VH-FVR, on a scheduled passenger flight from Canberra to Sydney, Australia. The first officer, who was pilto flying on the leg commenced descent with the autopilot engaged in vertical speed mode and a target airspeed of 235 kt (15 kt less than the maximum operating speed of 250 kt). At about 8,500 ft, the crew noticed the airspeed going up quickly and the speed trend excessively high. The first officer reduced engine power and used touch control steering to temporarily disconnect the autopilot before manually raising the nose to control the speed. The aircraft felt ‘heavy’, requiring the first officer’s two hands on the controls to move from the then -4° pitch angle (aircraft nose-up/down). The first officer expected that the pitch correction would be sufficient to arrest the speed trend. The crew consulted the pitch disconnect checklist and worked to identify which control column was free and working normally. Although both controls were free, it was decided that the captain would be pilot flying. During this process an intermediate airspeed around 200-210 kt was selected before reducing the airspeed to below the 180 kt specified in the checklist. The crew made a PAN call and requested runway 16 Right to minimise taxi time on the ground since a cabin attendant had been injured in the event. A safe landing was made. Engineers were able to establish that there had not been an overspeed but a vertical load factor of 3.34 g was recorded that exceeded the acceptable limit for the aircraft weight. A preliminary walk-around visual inspection did not reveal any aircraft damage. The aircraft was removed from further service that day and towed to a distant parking area to allow for the resulting maintenance inspection to be carried out. The engineer tasked with the inspection understood that one of the duty engineers had done quite a detailed walk-around of the aircraft in daylight and found no signs of defects. Later that night wing attachment fittings were checked and the upper surface of the wing, rear fuselage and tail were inspected using a torchlight. The captain conducted a walk-around inspection with an expectation of bird damage to the left side of the aircraft. The only abnormality found was a deformity to a fairing at the top leading edge of the vertical stabiliser, which might have been the result of a birdstrike. Upon closed inspection, an engineer noted that there was also significant structural damage on top of the tailplane. The aircraft was grounded. Information from the operator suggested that the damage to the tailplane might have been a result of the occurrence involving VH-FVR on 20 February 2014. 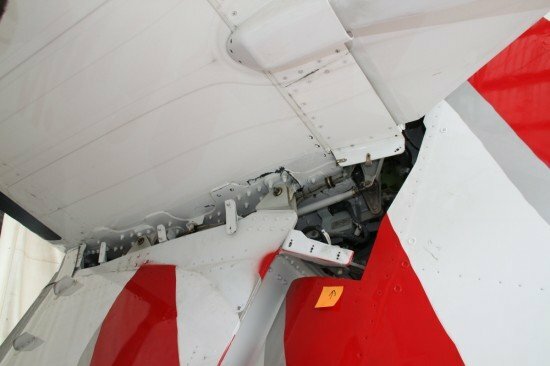 The aircraft manufacturer inspected the aircraft and found broken carbon plies, cracked joint sealant, and deformation in and around the area where the horizontal stabiliser attaches to the vertical stabiliser. There was also some minor damage to the rudder. The damage was assessed as being consistent with an overstress condition.